Probably only 2 fountains were given to DM by the National Humane Alliance. 30 were made every year and a total of about 125 were produced from 1906 – 1912. Herman Lee Ensign died in 1899 and created the fountain program in his will. Ensign had lived in Iowa and that may be the reason Des Moines seems to be the only city which received more than one fountain. It may also have something to do with Mr. Gatchel. Houston, TX could never decide on a place for a fountain and never did receive one. 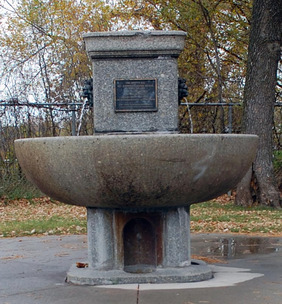 In Des Moines Theodore F. Gatchel (of the 1st Methodist Church & a Methodist Hospital organizer) had earlier put fountains around the city which also served people, horses and dogs, He was an ASPCA founder in Washington, DC. A memorial after his death in the Register of 4/16/1902, page 4, has an article about a DC memorial to him for laws regarding animals. Also see an article of 11/10/1895, page 6, Register about Mr. Gatchel and the police enforcing animal treatment laws. It may be from the Gatchel fountains that the number 15 came about. I am still working to find more info about this, but am sure DM did not get 15 fountains; but probably 2. This article needs changes. I remember my grandfather had a horse and wagon in to the 50’S and he lived on se 5th street. I also remember it being in the middle of the street and it was being used into the 60’s.